Wallflower ADSL in conjunction with Fingermark deployed a network of shoe finder Dynamic Digital Signage units in Rebel Sport stores throughout New Zealand. 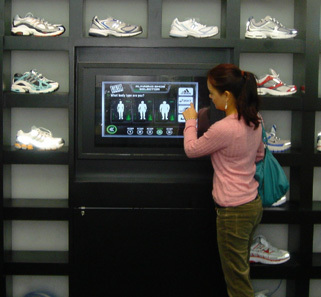 Wall mounted 32 inch interactive Dynamic Digital Signage displays are mounted in units surrounded by a selection of running shoes. Visitors are invited to enter their details to from a profile of their requirements for running shoes. Details such as gender, distance per week and an indication of any possible postural problems are entered. Videos are played showing different foot postures to allow visitors to identify any relevant information they should enter. After completing the profile the Dynamic Digital Signage Shoe Finder displays images of recommended shoes to allow the visitor to advise sales staff of their details. The implementation has brought a number of benefits to Rebel sport.